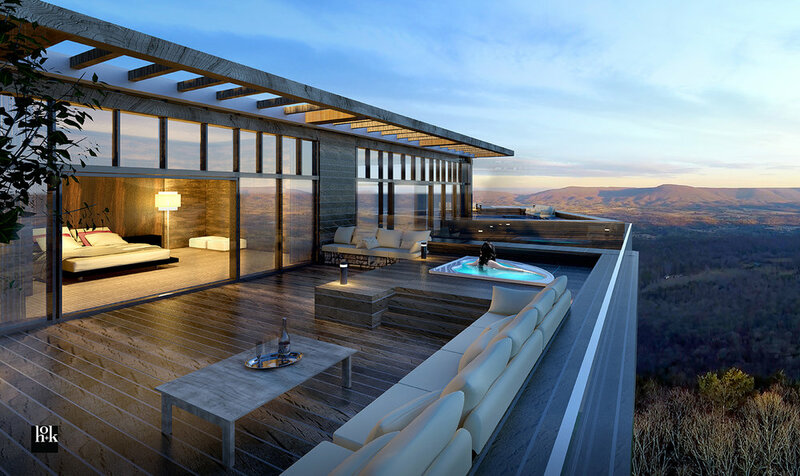 The McLemore Resort Lookout Mountain, Curio Collection by Hilton will soon offer an elegant getaway in mountaintop golf course setting, complete with spa and extensive meeting space. Designed as a mountaintop haven for guests looking for weekend getaways, special occasions and weekday corporate events, The McLemore Resort Lookout Mountain, Curio Collection by Hilton is the result of a partnership between Chattanooga-based Scenic Land Company and Hilton. The hotel, conference center and spa will offer 200-plus rooms and over 10,000 square feet of conference space set within a more than 800-acre mountaintop golf resort development. Sitting at over 2,000 feet above sea level, guests will enjoy dramatic, cliffside views across the pristine McLemore Cove and Pigeon Mountain, as well as numerous dining options, a world-class 18-hole golf course and relaxed outdoor amenities. The location is also set against the backdrop of McLemore Cove and its more than 20,000 acres of protected wilderness area. The guest’s first experience with McLemore will be the porte cochere, the courtyard entrance to the hotel. The drive up Lookout Mountain and through the McLemore residential neighborhood has kept the view a secret until now. Guests are moments away from walking across the courtyard and into the lobby of the McLemore to experience the breathtaking view that makes this location so special. 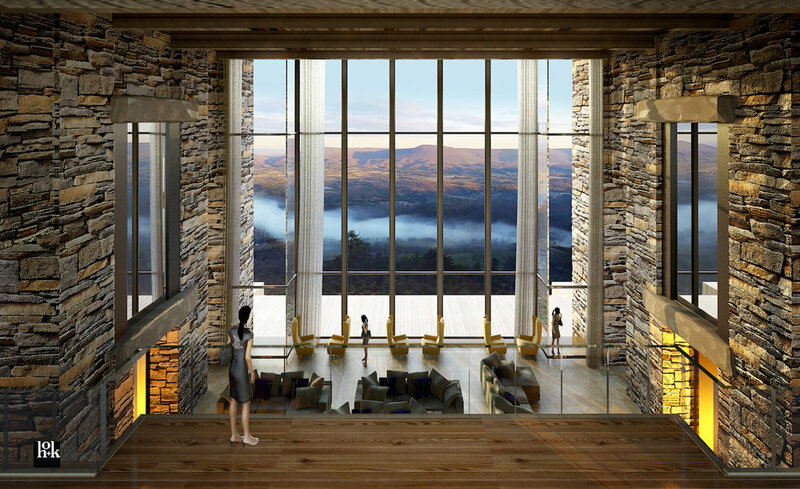 As guests walk through the main lobby to check in, they are met with a wall of glass, the edge of a cliff and a view east across McLemore Cove and over to Pigeon Mountain. Most mornings a spectacular sunrise will greet early risers. Typically, clouds hang low in the cove and swirl as the warm air heats them and causes them to rise and dissipate. Sunsets are equally beautiful. The warm glow from the west casts long shadows across the cove. This promises to be one of the most beautiful lobbies in the United States. For VIPs, McLemore will offer spacious and luxurious penthouse suites. Each will allow inside and outside enjoyment of the location, and will provide world class service for its guests. Even more spectacular then the main lobby will be the tower lounge. Set atop the seventh floor, the glass-walled tower lounge perches over the edge of the cliff and down into the cove below. At night, the tower will light up like a warm lantern where people can wander along the outside roof patio or stay inside to find a quiet corner to have a drink and talk. The McLemore Clubhouse will offer members and guests a comfortable place to relax after a day on the course. Amenities will include a bar and dining options, locker rooms, golf pro shop and ample room to unwind overlooking the new 18th fairway and beautiful McLemore Cove. Through the McLemore vacation rental program you, your family and friends can spend a night or a week in a comfortable, spacious home in the McLemore community. Our vacation rental program will allow golf play typically reserved for members only. For more information, please call (706) 398-0882.